Corona Foothill Lemon Company was established in 1911 by S.B. Hampton. What remains was the center of 2,000 acres of groves, the largest single lemon ranch in California. The headquarters and surrounding buildings were converted to Corona Heritage Park Dec 7, 2000 by a volunteer-run non-profit foundation. October 15, 2005 - A unique monument was made of used brick capped with an irrigation valve assembly used in the citrus industry. The monument is set back slightly from the public sidewalk and includes a concrete pad for convenient viewing. 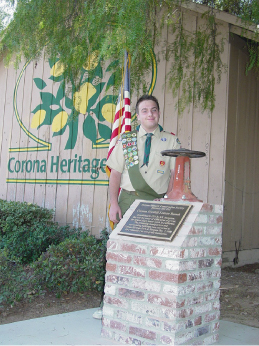 It was designed, coordinated and built by Life Scout Barret Roloson of Troop 107 to meet requirements to attain the Eagle Scout Rank in the Boy Scouts of America. The monument and plaque are the twelveth in a series placed throughout Corona at important sites. Marker placements are coordinated by the Corona Historic Preservation Society, the community’s political action group supporting architectural trusts.